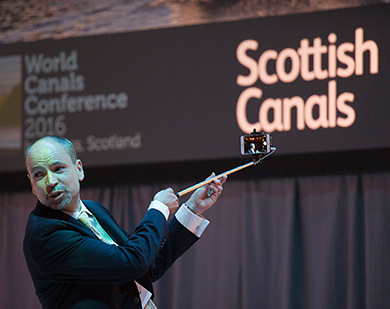 The World Canals Conference held in Inverness, Scotland, from 19th to 22nd September was one of the most successful ever, judging by the reactions of more than 300 participants. 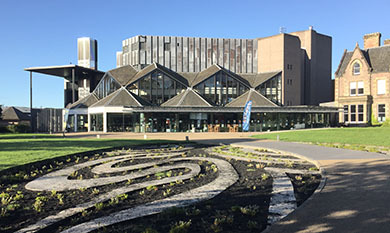 The event, organised by Scottish Canals, was based around Eden Court Theatre situated on the banks of the River Ness, with an extensive range of presentations and seminars over the four days as well as study visits to the Caledonian Canal and a number of entertainments laid on to showcase the history and heritage of the Highlands. Delegates from around 20 countries across the world travelled to the Highlands of Scotland, including Australia, Canada, India, Panama, South Korea, USA and many European countries. Among the delegates were navigation authority leaders, business professionals, waterway experts, society representatives, politicians and academics, all involved in some aspect of navigable waterways around the world. After a welcome from Andrew Thin, Chair of Scottish Canals, the four-day conference was opened by Fergus Ewing MSP. Introductory presentations were then given by Steve Dunlop, Chief Executive of Scottish Canals, as well as from the overall sponsors for the event, construction firm Mackenzies. Each day had a different topic and a specific sponsor, with Scottish Canals having been successful in obtaining the sponsorship of a wide range of companies and organisations to support the event. The topic for the first day of the conference was “Technical Challenges and Innovation”, and delegates heard presentations from four keynote speakers on the topics of geophysical tomography, the waterways of Canada, a Scottish Canals project to regenerate the canals in North Glasgow and the automation of bridges on the Gloucester & Sharpness Canal. Delegates then had the opportunity ask the 4 keynote speakers about pertinent issues during a Q&A session. The first day finished with a study visit to Urquhart Castle beside the shores of Loch Ness and a return boat trip back down the loch, followed by a welcome reception for delegates at the University of the Highlands and Islands. The theme for the second day was “Waterways as a Driver for Regeneration” and the day followed a similar pattern with 4 keynote speakers in the morning (followed by a Q&A session) talking about the Panama Canal, the waterfront of New York, urban regeneration and inland waterways of ancient civilisations. Parallel sessions then offered a total of 20 topics across 5 sessions on topics such as volunteering, engaging with canal-side communities, the effects of canal investment and canal regeneration transforming community well-being. Overseas waterways featured included the Erie and Delaware canals in the USA, and the National Waterways of India. Two of these parallel sessions about regeneration were given on behalf of IWA, with Mike Carter, IWA North West Region Chairman, talking about “Keeping our Waterways Alive – Cases for Community and Social Regeneration” and Dr Roger Squires presenting on “From super highway to linear park; reworking English canals to meet the changing needs of society”. 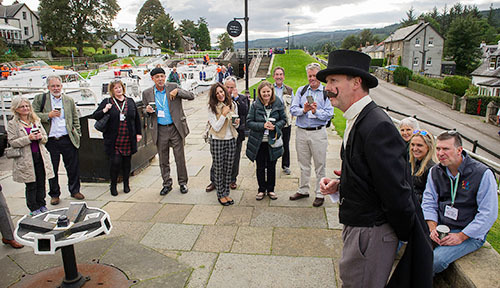 The second study visit was to Fort Augustus where Thomas Telford’s flight of 5 locks was admired and delegates heard about plans for a new visitor centre to promote the Caledonian Canal. A visit to an exhibition about the Loch Ness Monster may have dispelled some of the myths around the legend, but also left some answered questions, leading to the delegates peering out into the waters of Loch Ness on the return coach trip to Inverness. The third day’s theme was “Growing Tourism and Commercialising”, and included keynote speeches about architecture (making the place somewhere that people wanted to go), regenerating canals to create sustainable incomes, and waterways as “slow tourism” destinations. After another Q&A session there were 3 more parallel sessions with topics including getting younger people involved, solar electric marine transportation, different approaches to waterfront regeneration in Scotland, and presentations on the waterways of Leipzig, Milan and Kentucky. The afternoon study trip was to Culloden Battlefield where delegates heard about the last battle fought on British soil. Whilst not directly related to the waterways, it was interesting to put the Battle of Culloden in 1746 into context in terms of waterway development in the 18th Century; within a couple of decades the industrial revolution had commenced. The World Canals Conference Gala Dinner took place on the Wednesday evening – where the hosts took the opportunity demonstrate Highland hospitality and tradition, with a piper and fireeater welcoming people to the event, a traditional address to the Haggis, entertainments from a local youth theatre group, the opportunity for delegates to dance to a Highland Ceilidh Band, and the announcement of the winners of the inaugural World Canals Awards. The fourth and last day of the conference had “Safeguarding the Heritage” as its theme, and saw presentations from Sustrans Scotland, New York State Office and Dame Seona Reid DBE of the Heritage Lottery Fund who talked about what waterways projects had benefited from HLF funding so far. Mark Horton, presenter of BBC’s Coast series, then talked about the significance of ship canals, and Sebastien Chastin of Glasgow University talked about waterways and wellbeing – unlocking the health benefits of the world’s canals. After a Q&A session with these key note speakers there was a round table discussion on the theme of Delivering Transformational Change with 4 of the earlier presenters at the conference, including Steve Dunlop, Chief Executive of Scottish Canals. A final set of 3 parallel sessions offered 15 talks on subjects including climate change, the Broads Authority National Park and the Waterworks project on the Monmouthshire & Brecon Canal in South Wales. Finally, to round off the conference, delegates were given an insight into what the 2017 World Canals Conference would have to offer. It will be held in Syracase, New York, on the Erie Canal, with the chair for the 2017 event noting that Scottish Canals had given them a hard act to follow but they were up for the challenge. A call for papers is already posted on the 2017 conference website.